The Burly Bears customer care and satisfaction is one of our top priorities. We strive hard each and every day to maintain a positive upbeat attitude for life and our work. We hope to pass this along to all of our customers who visit our unique mountain gift shop, and hope to be able to pass that along to you The Burly Bear internet customers. Whatever your question may be our staff, and customer service representatives are here to help. If you are unable to find the answer you are looking for on The Burly Bear website feel free to contact us by phone or email. One of The Burly Bears staff or customer service representatives will be more than happy assist you to whatever capacity they can. We strive for your 100% Satisfaction!! Our lively hood and the lively hood of our Artists, Craftsmen and Manufacturers depends on our business stability and success. Without you our satisfied customers we have neither stability or success. The Burly Bear will always try our best to be fair and curtious.We want to put a smile on your face!! That way we can have one on ours!! The Burly Bear knows that our " Beary Happy" customers who are completely satisfied with their service and merchandise become repeat customers(friends and family), and tell their friends to come and see us!! We cannot expect you to place additional orders unless you are 100% satisfied with your last purchase. To make sure you have no reason not to return to shop with us.The Burly Bear stands behind every purchase with a 100% Satisfaction Guarantee. We want to thank all of our customers for helping us survive in our mountain community. We know the best way to do this is to offer our best. Best Service, Best Products, and Best Satisfaction Guarantee!! With every Purchase we promise to give you our BEST!! So shop with confidence, knowing that if you are not completely satisfied with your purchases we will do every reasonable thing possible to make it right!! Know that you can make returns for a prompt, no hassles, exchange or refund. The Burly Bear has been dealing face to face with our customers for over 10 years at our Pinetop,Az store location. We realize there may be reasons why you may be uncomfortable or unable to place your orders on our website. No Problem!! We have additional options of placing and processing your order. You may choose to call us, fax us,or mail us your orders. All of these options work just the same at getting you what you want. Some are just a little faster!! The Burly Bear accepts Visa, MasterCard, and Discover cards as well as official Bank Checks (Cashier Checks / Money Orders) for payment on telephone, fax and mail orders. The Burly Bear WILL NOT!! accept personal checks , C.O.D. or Payment Terms. ONLINE ORDERS Online orders can be placed using our secure online shopping system protected by " SECURE SHOPPING". Since our order system erases credit card information after two weeks for your protection, credit cards are automatically charged when orders are placed. Mail orders may be paid by credit card, cashiers check or money order. SALES TAX Sales taxes apply to products originating at our Pinetop, AZ location. These items will have the tax already built in to the purchase price(on our website) and no additional tax will be required. The Burly Bears standard shipping method is via FedEx or UPS. 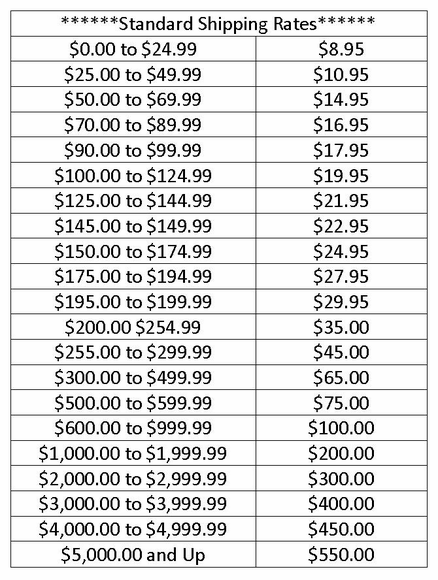 Standard flat rate shipping prices apply to locations within the contiguous U.S. (excludes Hawaii, Alaska and Canada).Customer must provide a valid street address at time of order,Neither FedEx or UPS will deliver to a P.O. Box or APO address. Customers will be notified with additional shipping charges for orders to be shipped outside of the contiguous United States. Deliveries that do not require a signature may be left in a safe place at the driver's discretion.This will usually be out of sight and out of the weather. Areaqs may include the front porch, back porch, side door, or garage area. If deliveries require special delivery instructions they must be noted at time of order. Express Shipping, 2nd Day and Overnight shipments are available on stock items upon request at an additional charge.Call us direct or email us at sales@theburlybear.com for direct quote. Quick Ship items are available for shipments to Alaska, Canada or Hawaii for an additional shipping charge. You will be notified of the additional charges prior to shipment.Call us direct or email us at sales@theburlybear.com for direct quote. TRACKING YOUR SHIPMENTS Upon shipment of your items. Your tracking information will be emailed to you.From this info you will be able to track your shipment using FedEx or UPS websites. Items may be returned for any reason within 30 days of purchase. Damaged items must be reported within 7 days of recieving delivery . Packages received by The Burly Bear after the 30 day time period are subject to a $20.00 returned-item processing fee.Will not be accepted!!!! CUSTOM AND PERSONALIZED ORDERS We can not accept returns or refund any funds for custom or personalized items. Made to order merchandise may be not canceled or returned. We will replace the merchandise if it is damaged at no cost to you.Damages must be noted and confirmed with delivery driver. Please indicate the reason for return on the back of the invoice provided with your order. Also indicate clearly whether it is being returned for refund or exchange. If you are returning the item for alternative merchandise, please supply the complete product item code number(s) of the item(s) you wish to obtain as indicated in our on-line store or catalog, and include any additional remittance as necessary. Enclose a copy of the invoice in the package with the returned item. If the package was damaged in shipment or was shipped direct from the manufacturer, please call Customer Service at 1-855-277-2327 or contact us by e-mail at sales@theburlybear.com before returning. Most product sold by The Burly Bear online is covered by a manufacturer's warranty that requires items to be sent directly to the manufacturer for replacement or repair. These manufacturers have different return policies and addresses that the items need to be returned to. If The Burly Bear makes a mistake on your order creating the necessity for return, your return standard shipping charges will be reimbursed. The Burly Bear will refund or credit the value of the item purchased and any taxes you were charged. Shipping charges are generally non-refundable unless the item was defective or damaged. However, if The Burly Bear made a mistake on your order creating the necessity for return, return standard shipping charges will be reimbursed ... Refunds will be credited to the same credit card as the original purchase. Please insure the package for the full value of the purchased item for your protection, as The BurlyBear cannot be held responsible for products within uninsured shipments. COD's will not be accepted. The Burly Bear - Customer Returns 1545 South Adair Pinetop, AZ 85935 You must call or E-Mail before returning any item so you can receive a Return Authorizationtion Number. The returns department requires at least 2-3 weeks turn around time for the issuance of credit or for the shipping of an exchange. All items purchased are warranted against defects in workmanship and/or materials. These types of defects will generally appear within the first year to a year and a half of use. Obvious abuse is not covered, but if any product sold by The Burly Bear fails in normal use, it can be returned for evaluation at any time. In most cases, manufacturer warranties, received with the product, will override our own. Unless otherwise specified by the manufacturer, the item must be returned to The Burly Bear for inspection. SPECIAL REQUESTS AND CUSTOM ORDERS The Burly Bear prides it's self on hard to find items,and custom designed pieces. Most of these items will be in our Pinetop, AZ store location due to thier limited quantities and need to be built custom. While it is almost impossible to have everything that everyone wants or is searching for, nor can any store or website possibly show or carry all the products from our hundreds of Artists, Craftsmen, or Manufacturers. We do however have a huge amount of resources to find "JUST ABOUT ANYTHING" you have seen(in other websites,movies,books,magazines, or on television) or have Artists and Craftsmen who can create "JUST ABOUT ANYTHING" Please contact us with requests for items seen else where or send us your ideas for a quote on your special custom pieces at findit@theburlybear.com . 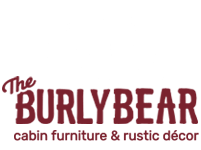 The Burly Bear has been dealing with Lodge,Mountain,Cabin, and Rustic Deor and Furnishings Since 1990. We are sure we can either find, make, or have made "JUST ABOUT ANYTHING" related to the Mountain, Lodge, or Cabin Lifestyle!! Thank You Again For Choosing The Burly Bear!! We Look forward to serving you again.